Legal conservatism goes to war with itself. In April 2000, a Vermont musician named Diana Levine went to the hospital with a migraine. There, a nurse incorrectly injected Phenergan, an anti-nausea drug, into her vein rather than her muscle. This led to gangrene and, eventually, the amputation of much of her right arm. Levine sued and won more than $6 million from a Vermont jury, which concluded that Wyeth, the drug company, had failed to warn her properly about the risks of the drug. Wyeth then countersued, arguing that the jury verdict was preempted by the fact that the Federal Drug Administration had approved a change in the drug’s labeling. According to Wyeth, this federal regulatory decision should have trumped a state court ruling. By 2008, the case had found its way to the Supreme Court. Most observers expected the justices to side with Wyeth. Among them was Diana Levine herself. Before the oral argument, I attended a panel with Levine, where she displayed her amputated arm and sang a song she had written about her grief and frustration that reduced the audience to tears. When the Court’s decision came down, however, it was a double surprise—not just because Levine won, but because of how she won. As many people expected, the four liberal justices had sided with her. But she had also won over Anthony Kennedy as well as the Court’s most conservative justice, Clarence Thomas. Only John Roberts, Antonin Scalia, and Samuel Alito had voted against her. The conservative justices on the Roberts Court are frequently thought of as a monolithic voting block, but, as Wyeth v. Levine suggests, they are often divided in unexpected ways. In this case, the three conservatives most sympathetic to executive power and business interests sided with the federal government and a giant corporation. The justice most devoted to states’ rights, Clarence Thomas, defended the prerogatives of a state jury. And the Court’s most libertarian justice, Anthony Kennedy, found himself on the opposite side of federal regulators. For the past three decades, if you asked reasonably well-informed people what legal conservatism was, they would probably have given you a straightforward answer that included the following buzzwords: strict construction, originalism, or judicial restraint. But something striking has been happening to legal conservatism over the past generation: It has been splintering into several distinct traditions, which are increasingly visible on the Supreme Court itself. While the five conservatives continue to vote together in many cases—as they did in this month’s Wal-Mart decision—legal conservatism is no longer the monolithic entity it once appeared to be. In the 1950s and 1960s, legal conservatism was more of an attitude than an ideology. From the congressmen who signed the Southern Manifesto in 1956—which denounced Brown v. Board of Education—to the dissents of John Marshall Harlan and Felix Frankfurter that criticized the Warren Court’s activism in cases involving reapportionment and criminal procedure, legal conservatives during the Warren era defined themselves more by what they were against than by what they were for. That began to change in 1971, when Lewis Powell, a moderate country-club Republican and future Supreme Court justice, wrote an influential memo for the U.S. Chamber of Commerce. Powell was concerned by a rising tide of environmental and consumer litigation, and he proposed the creation of an activist conservative legal movement to counter the trend. One person who heeded the call was a wealthy Ronald Reagan supporter named John Simon Fluor, who provided the seed money to start a conservative property-rights litigation group, the Pacific Legal Foundation, in 1973. Four years later, the beer baron Joseph Coors helped to establish the Mountain States Legal Foundation, a group focused mainly on federal land-use regulations. Business interests weren’t the only ones to answer Powell’s plea. They were joined by libertarians such as Clint Bolick and Chip Mellor, who would go on to found the Institute for Justice, and by Ed Meese, a zealous defender of executive power who, as chief of staff to then-California Governor Reagan, was outraged that his boss’s efforts to cut the welfare rolls had been challenged in the courts. Initially, the Federalist Society was successful at persuading conservatives to converge around a common rhetoric of “original understanding” and “judicial restraint” (although those terms meant different things to different factions). But the spirit of unity that animated the group during its founding didn’t last. Before long, the Federalist Society had succeeded in getting conservative legal intellectuals appointed to federal appellate courts, and conservatives found themselves not a beleaguered minority, but a newly empowered majority. As soon as that happened, divisions—old and new—began to surface. Perhaps the most striking split was the one between libertarians and those conservatives who tended to back executive power. This conflict was on display in October 1984, when the Cato Institute invited Richard Epstein, an intellectual guru of the libertarian movement, to debate Judge Antonin Scalia, who would be appointed two years later to the Supreme Court. Scalia, speaking first before a full house, argued that judges should restrain themselves from striking down federal laws in the name of economic liberty. To do otherwise would amount to a return to the Lochner Court—the early twentieth-century period during which the Supreme Court regularly struck down economic regulations for violating the liberty of contract. “Every era raises its own peculiar threat to constitutional democracy,” Scalia warned. “The reversal of a half-century of judicial restraint in the economic realm comes within that category.” Conservatives had to show that they had the courage to reject all judicial activism, including the conservative variety. In response, Epstein declared that his goal was to “take issue” with Scalia’s “conventional wisdom.” Judges should be much more aggressive in protecting economic liberty, Epstein argued. Minimum-wage laws and other “legislative regulation of the economy” were inconsistent with the constitutional principle that “parties should be free to set wage terms as they see fit.” They should therefore be struck down. Then, as now, Epstein represented a principled libertarian extreme, but his views influenced many legal conservatives, including Clarence Thomas. During his confirmation hearings, Thomas was questioned by then-Senator Joseph Biden over a 1987 speech in which he had expressed an affinity for Epstein’s ideas. (Biden theatrically waved a copy of Epstein’s 1985 book Takings: Private Property and the Power of Eminent Domain.) Thomas demurred that his interest in Epstein’s ideas was only academic. But, in a 1995 case, Thomas was the only justice to embrace Epstein’s dramatically limited vision of federal power. By a 5-4 majority, in United States v. Lopez, the Court struck down the federal law banning guns in schools. It was the first time since 1937 that the Court had invalidated a law on the grounds that it exceeded Congress’s power to regulate interstate commerce. But, in his separate concurrence, Thomas went much further than the majority opinion. (His argument so closely resembled the vision that Epstein had articulated in a 1987 article, “The Proper Scope of the Commerce Power,” that one scholar accused him of intellectual plagiarism.) Thomas called the Court’s repudiation of economic judicial activism in the ’30s a “wrong turn,” while signaling his openness to overturn Wickard v. Filburn, the 1942 case that affirmed Congress’s right to broadly regulate economic activity. But, while the anti-regulatory strain of Thomas’s judicial philosophy owes much to Epstein’s libertarianism, Thomas also embraces socially conservative positions—in cases involving abortion and gay rights, for example—that make true libertarians cringe. For this reason, Thomas cannot really be called a libertarian. Instead, he is the leader of a third faction that has begun to gain prominence in recent years. Call them the legal arm of the Tea Party movement. They combine economic libertarianism—and a willingness to use courts to strike down regulations—with ardent social conservatism and devotion to states’ rights. Much of their philosophy is traceable to W. Cleon Skousen’s book The 5,000 Year Leap, which became the movement’s constitutional bible after receiving an endorsement from Glenn Beck. Skousen’s ideas are a mix of John Birch-era opposition to communism, claims that the Founders were divinely inspired, populist opposition to international elites, and radical support for states’ rights. Traditional libertarians from the Epstein school are often surprised by the Tea Party’s constitutional ideas. Roger Pilon, the head of constitutional studies at the Cato Institute, told me that he was unfamiliar with The 5,000 Year Leap. And, when I described Skousen’s vision, Pilon questioned whether its social conservatism was consistent with the more libertarian ideas of many of the Constitution’s Framers. Thomas’s social conservatism appears to be at least partly personal: He shares the Tea Party movement’s hostility to Washington elites and spends the summers driving around the country in a motor coach. “Someone told me the best people in the country ... are in the RV parks,” he once told Rush Limbaugh. “I meet them at truck stops, rest stops. Those are my kind of people.” But, however he comes by it, Thomas’s social conservatism has placed him even to the right of his fellow conservative justices on some issues. Like Skousen, Thomas has insisted that the Founders did not intend to prevent the federal government from promoting religion. “Congress need not observe strict separation between church and state, or steer clear of the subject of religion,” Thomas wrote in a 2005 concurring opinion. And, in 2007, when the other conservatives held that the First Amendment doesn’t protect a student’s right to display a banner declaring, “BONG HITS 4 JESUS,” Thomas wrote a separate concurrence declaring that “the First Amendment, as originally understood, does not protect student speech in public schools” under any circumstances. 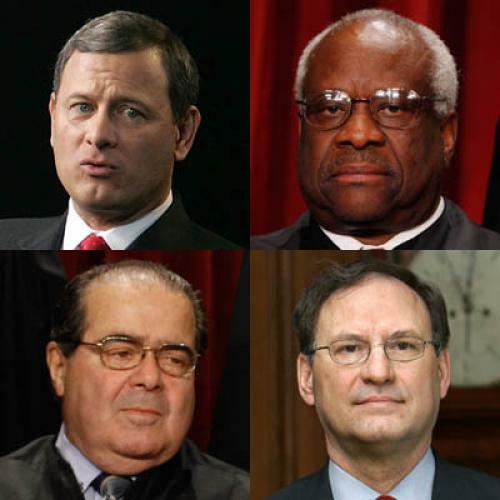 What about the other three conservative justices—Roberts, Scalia, and Alito? They are neither Tea Partiers nor true libertarians; instead, they are executive-power conservatives, and they subscribe to a far more expansive vision of federal power than either Thomas or Kennedy. All three served in the Ford or Reagan administrations in the Office of Legal Counsel (OLC) or the White House Counsel’s office; and all came to be supporters of the “unitary executive” theory, which holds that the president needs complete control over the executive branch—including the power to fire executive officials. In a speech to the Federalist Society in 2000, Alito recalled that, when he was at the OLC during the Reagan administration, “we were strong proponents of the theory of the unitary executive, that all federal executive power is vested by the Constitution in the president. And I thought then, and I still think, that this theory best captures the meaning of the Constitution’s text and structure.” Kennedy, by contrast, has repeatedly rejected this theory. In other cases, the pro-executive conservatives have fiercely defended executive prerogatives. They dissented, along with Thomas, in Boumediene v. Bush, where Kennedy and the four liberals held that Congress couldn’t suspend the writ of habeas corpus for suspected enemy combatants detained at Guantanamo Bay. “This decision is not really about the detainees at all, but about control of federal policy regarding enemy combatants,” Roberts wrote in his dissent. Scalia went even further, denouncing the “disastrous consequences” of Kennedy’s opinion. The nationalistic instincts of the three pro-executive justices go a long way toward explaining the Roberts Court’s pro-business record. As New York Times reporter Adam Liptak recently noted, the Roberts Court, during its first five terms, ruled in favor of business interests in 61 percent of business-related cases, compared with 46 percent in the last five years of the Rehnquist Court. Many of these cases involve claims that consumers injured by defective medical devices or drugs shouldn’t be able to recover compensation for their injuries, because state jury verdicts are preempted by federal regulation of the medical device or pharmaceutical industry. They are often decided by lopsided majorities, since the liberal and conservative justices share a suspicion of what they consider “regulation by litigation.” But, as Wyeth v. Levine showed, these cases sometimes cause Thomas or Kennedy to peel away from the other conservatives. As for the three pro-executive conservatives, if they are true to their judicial philosophies—which lead them both to revile Roe and Lochner and to defer to the executive branch—they will vote to uphold the health care law. Of course, whether they do or not is another matter; as Bush v. Gore shows, justices sometimes abandon their principles in the most politically polarizing cases. But, regardless of what happens in the health care lawsuits, political preferences don’t always rule on the Court; judicial philosophy matters, too, and it is clearly leading libertarian, Tea Party, and executive-power conservatives to diverge in significant ways. As a result, the days of speaking about legal conservatism as a single, coherent entity—united by a common commitment to originalism or judicial restraint—should now be over. Jeffrey Rosen is the legal editor of The New Republic. This article originally ran in the July 14, 2011, issue of the magazine.